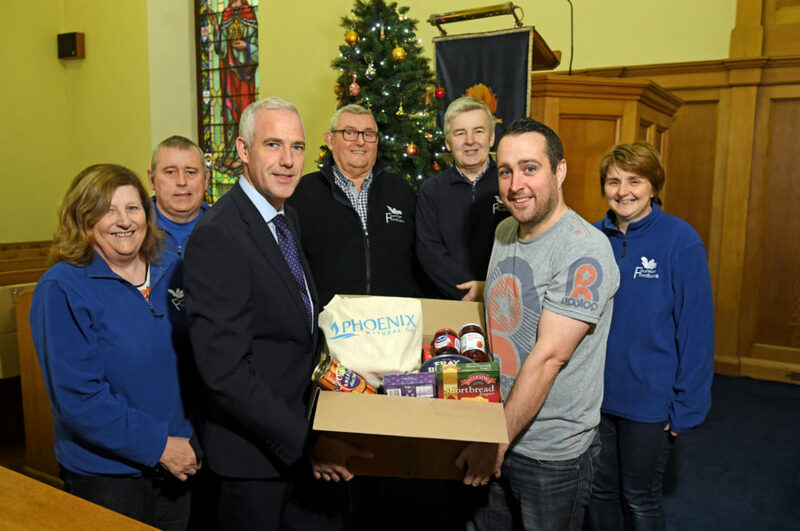 Fountain Foodbank and the Downpatrick branch of the Simon Community received a welcome boost from Phoenix Natural Gas this week as the company helped ‘warm up’ the charity’s Christmas Hamper Appeals by delivering much welcome supplies for families in need this Christmas. Working with the respective charities, staff at Phoenix Natural Gas contributed boxes of much needed items including festive treats, non-perishable food and household products which will be distributed to dozens of families in time for Christmas day. Jonathan Martindale, Executive Director at Phoenix Natural Gas, said, “For the past year Phoenix Natural Gas has been working closely with the Downpatrick community as we construct the natural gas network in the town and bring the many benefits of natural gas to around 5,000 properties in the local area. “Phoenix Natural Gas has a long history of engaging in corporate social responsibility initiatives to add deeper value to the communities that it serves. Since work commenced in Downpatrick at the beginning of this year, we have been delighted to support various community initiatives including the East Down Athletics Club’s Rollercoaster Races, the Down Time Festival’s ‘Night at the Museum’ event and the Three Lakes Run, as well as supporting various sporting clubs such as Downpatrick Bowling Club and the Down Special Olympics. Shirley Lennon, Volunteer Coordinator at Fountain Foodbank, said, “Fountain Foodbank was established in March 2015 and since then we have been providing food for people in need, whilst also offering a point of refuge and a listening ear for those who may need our support. We are made up of volunteers from right across the community and to date we have helped over 6,000 people. “We are overwhelmed with the support we receive from local businesses and the community for the Hamper Appeal, with many not only collecting items themselves but also acting as drop off points for the wider Downpatrick community to also donate. We were delighted when Phoenix Natural Gas contacted us to lend their support to our Hamper Appeal and also to the Simon Community appeal, who are one of our key partners. Jonathan Martindale from Phoenix Natural Gas, is pictured delivering much needed hamper items to (L-R) Ann Millar, Barry Redhead, Paul Connelly, Robert Shields, John Millar from the Simon Community, and Shirley Lennon, Volunteer Coordinator at Fountain Foodbank.